CanadaOnCanvas.com: COUPON CODE -THIS WEEK ONLY! THIS IS HUGE- SAVE 30% ON ALL CANVAS + FINE ART PRINTS, this week only! Got those lovely summer vacation and family photos? Now print them as a Christmas gift - at nearly 1/3rd of the price! 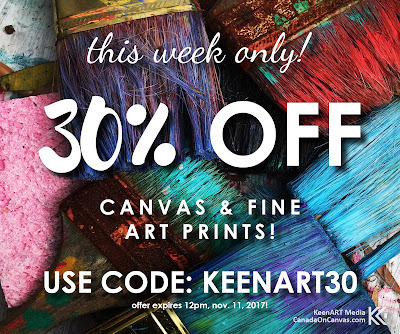 Use the KEENART30 discount code at checkout & save 30% on regular priced Canvas and Fine Art Prints! As usual, Free Shipping on orders above $99! Ordering it as a Christmas present? Ask for December shipping - and we will drop ship your order to your recipient in December! Offer expires Sunday, Nov. 11, 2017 at midnight. Use KEENART30 now at CanadaOnCanvas.com and save!